Pianist Alexi Tuomarila has been a glowing, itinerant presence on the European jazz scene for some fifteen years. Now, settled back in his native Finland, he is releasing his second trio album with Edition. He’s teamed up with his regular band that has the look of a European super-group. 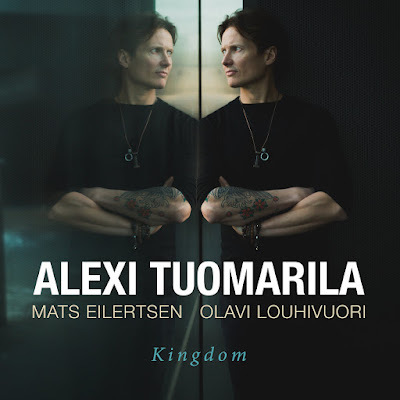 Norwegian bass player Mats Eilertson released is ECM debut as a leader last year and Finnish drummer Olevi Louhivuori is the driving force behind Odarrang. The trio share the writing credits for this varied set and there’s a cover of Dylan’s The Times They Are A-Changing. The Sun Hillock kicks off with a relaxed funky groove. Tuomarila’s left hand and the bass outline the melodic hook. Bass and piano solos follow with Tuomarila’s easy fluency spooling skipping lines across the rhythm. Rytter is more impressionistic with rippling arpeggios and colour from the drums. Fragments of melody come and go. The Girl in a Stetson Hat has an easy rocking momentum and rich cycling chords ground the song like melody. Tuomarila is at his most free-wheelingly lyrical in his solo. Vagabond first appeared on Toumarila’s quartet release with Edition, Drifter. The stuttering, staccato riffs have a more abstract, fractured feel on this take compared to edgier take of Drifter. The Dylan cover has an urgent flow and a bright, optimistic skip to it, there’s a sense of contentment and joy in Tuomarila’s changing times. Shadows, a Louhivuori contribution, is darker. A bass solo shades into an exploratory group improvisation before halfway through a racing pulse takes hold and the band fly, the leader unleashing a blistering solo. Aalto is a melodic evenly grooving number, Bruin Bay’s gently marching theme is kicked along by snappy off-kilter riffs. White Waters closes the set with a more meditative atmosphere of gently rocking lyricism. Tuomarila’s trio is a formidable unit. All leaders in their own right, they play, as all great trios do, as a single unit. This set repays repeated listens. It has a reflective, quietly joyful air to is even as they occasionally let rip.